A lighter take on a traditional Eton Mess, this isn't a dessert for those that like their food looking pristine and picture-book-perfect. How can you, when one of the main ingredients is smashed meringue? 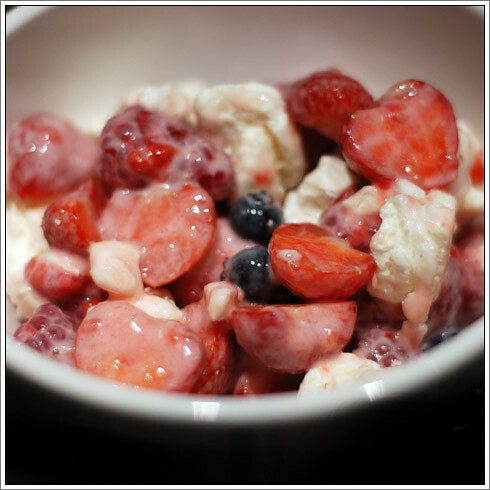 An authentic Eton Mess is meant to be served with strawberries, cream, meringue and a little additional sugar. I like a bit more variety in mine, so the recipe has morphed into something a little different. And personally, I prefer it to the much richer and sweeter original as it pays more attention to the fruits used. For the meringue, you can make your own so long as you cook them very, very slowly - you want as little chewy stickiness to the meringue as possible and for them to break easily. I prefer to cheat and use a packet of pre-made meringue nests - the M&S ones are the best I've used. Wash the strawberries, remove the hull and then chop into bitesize pieces a little larger than the raspberries then place in a large serving bowl. Wash the raspberries and blueberries too and add to the bowl. Next, break up the meringues so they are in large chunks, then add the yogurt. Fold all the ingredients together, and then if you're feeling posh, transfer to a clean bowl to serve. Eat immediately - you don't want the meringue going soggy!